Welcome to part 3 of 3 of The Solving A guide to PowerShell. Check also Part 1 and Part 2. In this final part we will combine the concepts learnt so far and demonstrate practical uses of PowerShell for System Administrators. PowerShell can make the life of an IT Administrator much easier and can be used to manage your infrastructure effortlessly. PowerShell is a fantastic tool at making server management simple, it is great at gathering information about your Server and displaying that data in different formats. This part of the guide will introduce several new concepts. Take your time and work through each part individually. What software is installed on my system? Get-ItemProperty HKLM:\Software\Wow6432Node\Microsoft\Windows\CurrentVersion\Uninstall\* – This part of the command tells PowerShell to look in HKLM and browse to \Software\Wow6432Node\Microsoft\Windows\CurrentVersion\Uninstall and get all properties inside. HKLM is the PowerShell filesystem for the Registry! The rest of the command simply grabs specific data (DisplayName, DisplayVersion, Publisher, InstallDate) and outputs it to a Table. Additionally, you can browse the registry direct from the Shell by typing cd HKLM:\ you can then navigate the HKLM just as if you were using Command Prompt or Windows Explorer. What Windows patches are installed on my system? Finding information about hotfixs and KB articles was extremely complex in PowerShell. Microsoft has recently released the cmdlet Get-Hotfix. This is a great tool for interrogating your infrastructure to see what Windows Update patches are installed, or to see if a particular hotfix is installed. I found this knowledge was extremely useful when the WannaCry Ransomware exploit was released in 2017. PowerShell allowed me to search nearly every single Windows Server I manage to see which server was patched, and which was still outstanding and vulnerable. This will produce a list of what KB are installed on your local system. Now we can use the power of the shell to interrogate multple computers. To do this we will introduce PowerShell ISE (integrated scripting environment). If you want to search for a specific KB, for example KB2977629, you need to add the cmdlet Where-object HotfixID -eq “KB2977629” into the script. How do I search the Event Log for Errors? The Event Log is a vital tool for looking at system issues. PowerShell can greatly improve the time and effort needed in seaching the event log. The above command will search the “SYSTEM” event log and display the newest errors in the last 30 alerts. You can change the Event log to search for the Application or Security Logs. PowerShell can interact with every system toolset of Windows. It is very useful when interrogating Active Directory. Here are a selection of scripts I find useful when querying AD. Before we do anything we must have the Active Directory module enabled in the shell. The simpliest way to do this is to run these commands on your domain controller, however, this is not always possible so please note that you can also add this role directly onto your system (providing it is a member of the domain you wish to query). Once installed you can now use the Shell to query and edit Active Directory. Please proceed with caution if working on a production environment. Active Directory in PowerShell is another large subject to understand. Rather than go through every command step by step, here I have listed my favourite commands, the one’s that I use frequently when managing and maintaining Active Directory. 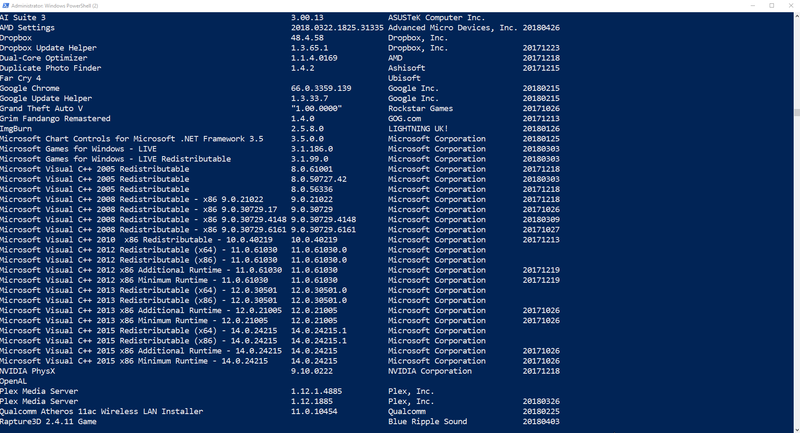 You can use the get-help command to read in detail about these Active Directory cmdlets. Querying user accounts is very simple in PowerShell. The commands in the table below will explain how to search for users, look for users with non-compliant password policies, users who are locked out, disabled accounts etc. Group membership in Active directory will tell you which users are members of which group. This can be extremely useful when you need to see who all the Domain Admins are, or ensure the security and compliance of your domain. These commands will give you environmental information about your estate. You can also use PowerShell to edit Active Directory. Use this with caution especially if you are learning PowerShell. That completes The Solving A Guide to PowerShell, this has been a whistlestop tour and introduction to PowerShell. I hope that it has given you a taste of what PowerShell can do. We have literally just scratched the surface with what you can do in PowerShell. I have been learning PowerShell for 3 years and every single day I use it I am learning new techniques, tips and tricks. It is a wonderful tool for system administrators, and it can make the system administrators task much easier.